This Thursday at The Rag Factory, UK based photographer, artist and illustrator known as Ashes57 will host an exhibition of her photographic work, featuring pictures of iconic figures from the hip-hop and dubstep scenes the world over. Delphine (Ashes57) has been well placed to capture memorable moments from some of the UK’s biggest dubstep nights including DMZ, Outlook and FWD and as a result, her exhibition will feature shots of Loefa, Mala, Coki, Joker, Skream, Benga and Oneman. On top of that, you’ll also find images of hip-hop and rap dons like Public Enemy, Madlib, RZA and Ghostface Killah. The Message takes place this Thursday, 6-11pm. 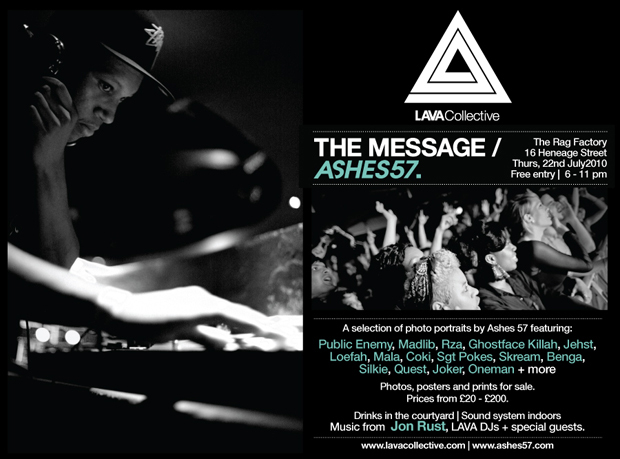 More info on the flyer above and more from Ashes57 here.